Not enough info ^ for anyone to offer meaningful advice. Post pics. It would help to know roughly where the tools are located. That will help with people on this site that might be interested in what you have for sale. You might also look in your community to see if there is a local wood-working club. They have probably dealt with estate issues like this before and might be very helpful. Thanks for the condolences! He was a great guy. I am in Cincinnati Ohio area. Thanks for the tips! This is a difficult question to answer and one I have wrestled with in my estate planning. I am a hobbyist whose tools were expensive and have endured light use. I have regularly counseled my heirs to ensure that my tools fetch a fair price. Since I am the only woodworker in the family and fearing my heirs might grossly undervalue some of the tools, I offer the general rule to expect no less than 50% of the “if bought new” price of the item, but generally to ask 2/3s of the “if bought new” price. However, my goal is to maximize financial gain to the estate and therefore it could take some time to settle my estate. An alternative goal could be to settle the estate as soon as possible even if it means accepting less than market value for the assets. Whatever the goal, perhaps my personal above-listed guidelines are of some help. After a quick scan of the www, I did not see the open stand Jet jointer offered new. The current Jet 6” jointers start at about $1000 new. Pricing your brother’s Jet jointer at $675 could be a good initial asking price. From the photo, it appears in good condition and there were only two jointers on the Dayton Craigslist (which includes Cincinnati) when I checked; $495 and $2000, neither are Jet. A new Delta benchtop mortiser sells for $400. One Dayton Craigslist mortiser is priced at $200. But Mt. Gilead, where it is offered, is in the middle of nowhere in Ohio, therefore an initial asking price of $300 in Cincinnati might sell the mortiser. I suspect you would be lucky to get $25 – $50 for the Delta tenoning jig, but asking $75 might be a good asking initial asking price. Sorry for your loss and good luck in selling your brother’s equipment! Suggest you check out EBTH.com – online auction company based in Cincy specializing in estate sales. I’ve been following for several months and wood working tools seem to get good prices. The jointer is probably worth $300 max. It’s a standard Taiwanese 6” jointer. The open stand is a negative. Ask for $350 and take the first $275 offer you get. Used tool prices vary a lot by region. You really need someone local. Try contacting a local woodworking store and asking about clubs in the area. Not only will they know the value, they will be the buyers. The regional pricing variations do count for a lot. 50% of new comparable pricing is a good rule of thumb as a start. But the concept of comparable means looking at other brands as well. 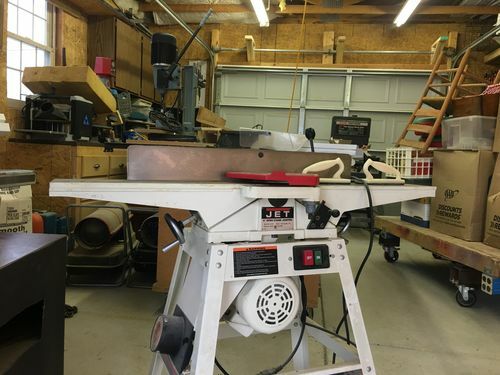 In some areas that jointer might be $300 or less, but in Houston good condition used equipment is not that common and sells quickly, so here $400 to $500 might not be out of line for that jointer. Around me mortisers are not as high demand as a jointer, so you might expect to take a little less or be willing to list it for longer. While other pieces of good condition equipment move pretty quickly on CL here, mortisers tend to sit for a bit. As others have said, you have to worry about comparable equipment prices, and availability of these tools at time of sale in your local region. If you have luxury of unlimited time to sell, then it is easier to find right buyer, or right time to get a higher price for your used equipment. Ask 60% of list, expect to get 40-50% when sold. This assumes: you bought it new, light use, and like new condition. Most typical wood working tools will sell for 50-60% of list prices assuming you have time to wait for the sale. If you desire a quick sale, then asking 40% of list (or 50% of comparable tool list) usually makes things disappear quickly. If you are 2nd owner of used tools, then average resale rate is about 30-35% of list. Used Taiwan made 6” long bed jointer can be had for less than $350 by anyone with time to shop for it. The mortise machine is hard to sell due limited market compared to mortise hand chisel? Also, Harbor freight used to put their version on sale for $99, and after spending $50 for Jet/Delta mortise bits to replace HF junk bits, they worked pretty well. I see HF units for sale <$100 about once a month in Phoenix. HF no longer sells the mortise machine, but it poisoned local market with <$200 prices regardless of brand for entry level <1HP mortise tool. The tools are all old enough they are all out of production. From the photos the Jet jointer is probably the best tool there and it’s not the top model that was available when it was purchased. 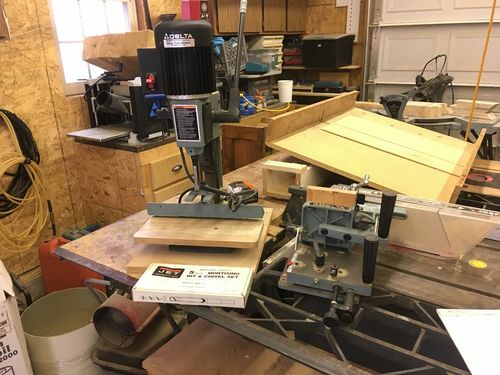 Roughly equivalent tablesaw brand new at Lowes $600, roughly equivalent jointer brand new at Home Depot $600, equivalent planer from Amazon $263, I can’t tell what is in the back next to the garage door. if the Craftsmam bandsaw is one of the ones that tilted the blade instead instead of the table it is unique in that design, but not in a favorable way. A new entry level 14” bandsaw is $450 at Lowes. Good luck to you and your families. Only tools for sale are the jointer and mortise and tenon machine!